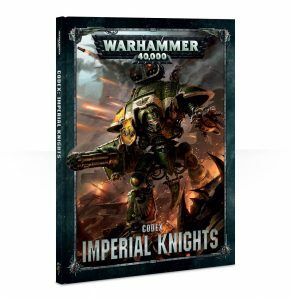 Welcome to the second part of my Imperial Knight codex review. 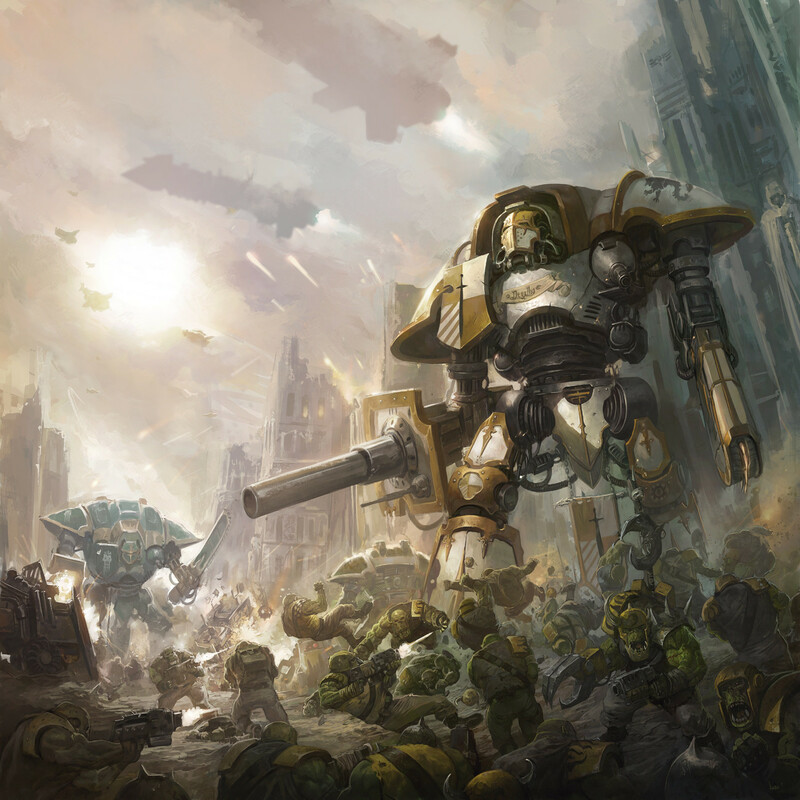 In this part of the series, I delve into the rest of the codex, looking at all the units, how capable they are and how to get the best use out of them. These guys are awesome! Something has been missing for a while from the knight codex, an option which isn’t a crazy 400 point robot. I’ve been saying for a while it would be so cool to have some mini-robots which you can take to beef up your army a bit and these guys definitely pack a punch! With T7, 12 wounds and a 3+ save, they come in as quite durable. What makes these stand out? Their Armiger Autocannons. Now I’ve heard some people and bloggers aren’t overly fussed. Some even as bold as saying “not overly impressed”. Well let me tell you something, how many armies have access to flat 3 damage which provides a solid number of shots for 174 points? The one that springs to mind is a Hammerhead. This bad boy gets 2 single shot missiles and D6 str 8 flat 3 damage shots for 175pts. The D6 averages 3-4 shots a turn, potentially hitting on 2’s with a re roll (buffs from Longstrike and marker lights), but that is more points. So for 174 points, you don’t get the missiles, lose a str, but gain extra shots, 4d3! That’s an average of 8 shots, double the hammerheads! The hammerhead is more versatile with having access to 8 str 5 shots as well, however for something that can sit back and shoot from turn 1 (60 inch range guns) I believe these guys to be up there in one of the bets units in the book. Now I wouldn’t go as far to say these should be spammed, but having anywhere between 2-3 should give you some very solid backfield firepower! Remember, being str 7 still wounds custodies on 3’s, which is what we all like to hear! So what household? Personally I would go for Vulker which allows you to re-roll 1;s to hit when targeting the nearest unit. 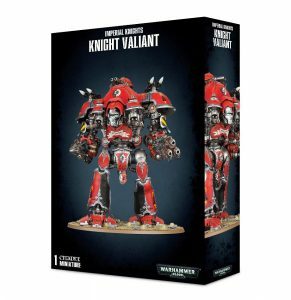 Can be useful, and also gives you access to their stratagem Saturation bombardment which is awesome, more-so for the bigger knights. As these guys aren’t new, I won’t delve too deep into these, but they are a nice addition to any army looking at getting a cheap option in. With a solid stat-line and moving 14 inches a turn they can get into combat quite fast (even quicker with House Teryn and the ability to advance and charge). I personally would take a look at the Helverin over these, but if you are strapped for points, then these are a great second choice. Keep them cheap and when using them, always stick to using them as a blunt instrument, taking down the biggest thing that gets within their thermal spear range. I’d keep them near their cousin knights and use them as an extra charge threat and remember their sweep, they can have 8 attacks at Str 6 -2 1 damage which is fantastic at clearing infantry!! I really don’t rate this guy. He seems great as he gives re-roll 1’s for your Armigers, but for the points I would simply take more Armigers. The Las-Impaler is also a fairly weak weapon of choice in comparison to a lot of other knight weapons out there, and is quite a short range for the nasty “High Energy” version. Personally, go next! The staple Knight within the codex. Great ranged weapon, great combat weapon, he is an all-rounder. I love the rapid fire battle cannon and in the state of the meta, it is great to have a ranged weapon that can plink wounds and potentially take down things in the backfield which harass knights such as fire prisms, hammerheads, Obliterators etc. No specific traits stand out but if you are going to take one, definitely consider the relic “Thunder Of Voltoris”. Not only does it increase the str to 9 (wounding other knights on 3’s is massive) but you can roll 3d6 and pick the highest for the number of shots, fantastic! Same as above except with a Thermal Cannon. Personally, it comes down to your meta. Do you see a lot of mid-field high T/W threats? Go for this guy. If not and you tend to face off against gunlines like Necrons and Tau, stick with the battle cannon. Personally I find the battle cannon more reliable, so consider that when building your army. This is where the fun starts. Skip all the guns, and give this guy the rampage he needs. The Galant is a great buy for knight armies and as an ally. Why? Because he is only 354 points!!! This means you can easily take a detachment of 3 for just over 1000pts and still have plenty of points for an army of its own. I love these guys because you can do a lot of tricks with them using stratagems and household abilities without worrying about shooting, just throw them forward and gain huge board control. You can take Teryn for the extra range to advance then advance and charge with one of them, or Hawkshroud and use the Staunch Allies to heroically Intervene 2D6 to any IMPERIUM unit which is fantastic! House Mortan is a great choice for re-roll 1’s in combat. There are lots of combos, but the best thing is they are so cheap so you have no issue with advancing them forwards, making them a very serious threat in combat!! I put these two together as they fulfil the same except one has a combat weapon the other doesn’t. I personally rate these guys for the weapons choices and if you need the fire power, go for the Crusader, albeit it is very expensive! Vulker would be the best choice for these due to the volume of shots, and don’t forget the Avenger Gatling Cannons relic for the extra shots and 6’s producing even more hits! Wow, what a waste of points! His Freedoms hand is a massive bait. Don’t fall for it. It sounds great at first but with 4 attacks hitting on 3’s with no re-rolls, I am not sold. He is a freeblade so you can get some funky bonus’s but for his points, I just don’t see why you would consider him over cheaper variants, or even just going a crusader. New knights, lots of guns, huge, looks epic! What is not to love? Well, the points is a start. I love the new knights, and they are shiny, but are they worth it? This variation comes with a Plasma Decimator (overcharged gives you 2d6 str 8 -3 2 damage shots) which sounds fantastic, but you are suffering 1 mortal wound for EACH roll of a 1 to hit you make. That is insane!!! For a model which relies on its high T and wounds, losing wounds for just shooting is insane. This means you have to take something which gives him re-rolls to hit (Vulker) or hope you don’t face anything with negatives to hit (most of 40k)….lets take that into consideration for a bit….yeah I don’t like it either. With no way of swapping this out, I’d steer clear from this bad boy. His secondary weapon, the Volcano Lance, is awesome. A toned down version of the Stormshadow but still a great Titan killer…IF you roll high on your D6 shots. Remember, you’re hitting on 3’s and only re-roll to wound, so even with an average of 3-4 shots you could only get 2 hits making it not as effective as it looks. Overall, I personally would stay away from this guy. Weighing in over 600 points for these guns seems a bit crazy to me. Here we go, this is where the fun starts. Let’s start with his secondary weapons as I did not cover them before. He comes with a twin Siegebreaker Cannon which is fantastic at plinking wounds off multi-wound units like Custodes Bikers. He also comes with 4 Shieldbreaker missiles which are a one shot only weapon, str 10, -4 ignoring invulnerable saves. For 2 CPs you can hit a character. Now that sounds amazing but in truth, it’s pretty average odds. First it only works on 1 missile, you need to hit and then wound, so T6+ characters aren’t fussed as much. Then you need to hope you roll high on a D6. Great for sniping low wound characters like Guard and Warlocks, rest tough marine characters, you’ll need luck on your side. Personally it’s a nice little addition but not as reliable as it looks. Now compared with the Castellan, this guy can swap 2 of its Shieldbreaker missiles for another twin Siegebreaker cannon. Personally I really like this option, as having an extra 2D3 str 7 shots is great!! It comes down to preference but I do like this option personally. Conflagaration Cannon: Oh boy, this is a BEAST! A giant flamer which actually hurts? 3D6 shots to boot? Flat 2 damage? So Custodes and characters will NOT be happy to charge this, even more so with the Hawkshroud “Staunch Allies” ability to overwatch then heroic intervene, now THAT is scary!!! Amazing weapon, offensively and defensively. With a high threat range to boot, this weapon is amaze balls! Thundercoil Harpoon: Ha, so this is the best gimmick in the boo, but this time, it’s at least remotely reliable with re-rolls to hit against Vehicles and Monsters which will be the target of this beast most of the time. Str 16 means you’re wounding on 2’s against anything, -6 AP so only invulnerable saves can be taken, and a flat damage of 10!!! Whats it’s weakness you ask? Well it is only 1 shot and 12 inch range so expect to be in threat range when you use this. But who cares? Surely it’s the opposite and the opposing army is in threat range of YOU! To add insult to injury, if you cause any damage, you can cause another D3 mortal wounds. So you can potentially one shot most 11 wound vehicles/creatures and potentially up to 13 wounds. That’s pretty epic! This beast also comes with two twin-meltaguns for even more firepower, so this thing when it gets up close can absolutely demolish large units! I love it. If you aren’t taking one of these, then I ask you good sire…WHY NOT! They are epic and awesome sauce models. So now we have units covered, I’ll be looking at some example builds on how to make the most out of them. Expect part 3 soon with some example lists!